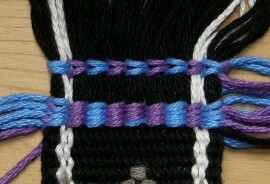 Here I show you a little about basic weft twining and have made a couple of videos. My interest in this technique goes back a long way starting with Cheryl Samuel’s beautiful book on Chilkat dancing blankets and I have written about this in several previous posts. 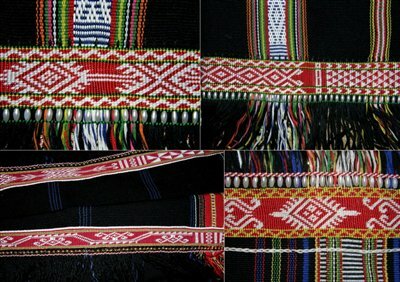 What got me out of the book pages and into the technique was seeing the twining on textiles made by the Montagnard (Vietnamese hilltribe) backstrap weavers. They call this twining technique kteh. Some of their traditional designs can be seen above left. On my first visit I only got to see the designs and didn’t see how they were created and so I started on some off-loom twining experiments using thick yarn as weft twined around cotton string. 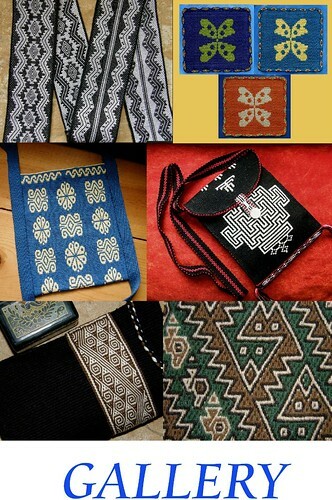 I copied some of the Montagnard designs as well as woven motifs from Bedouin textiles and played with one, two and three-color twining. I also started some one-color textured twining but got distracted when the opportunity came to actually go and learn twining with the Montagnard weavers and so I will return to the textured twining one of these days. The Montagnard weavers twine their pieces off-loom. They twine the edges of their skirts and blankets. To make these large pieces, several panels are woven and then sewn together. Then the twining is added along the edge of the connected panels. I also understand after having spoken with Ngach that there are specialists to whom weavers take their cloth to be twined. Ju Nie often sends her skirt fabric back to her sister in Vietnam who twines the edges and returns it. 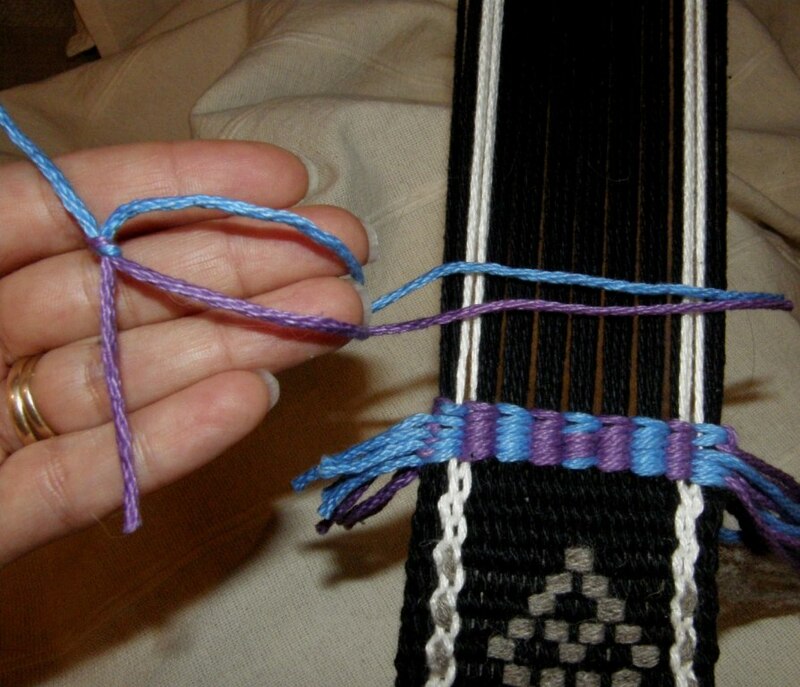 Even small pieces are twined off loom. The fabric is hung on a specially made stand or on a bar which is rests on two pieces of furniture. 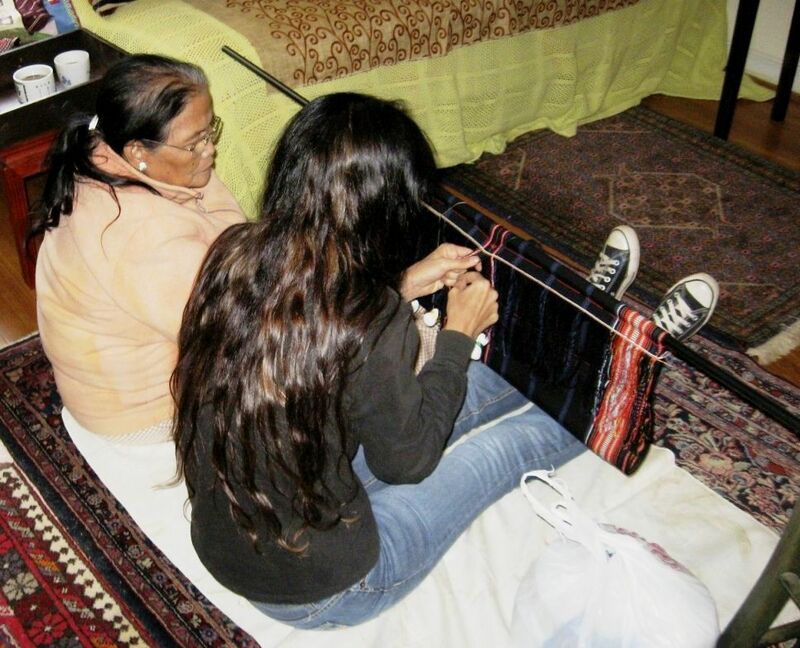 Here I am learning to twine with Jarai weaver Ngach. This is a beautiful way to twine. The thread that Ngach uses is fine and she has her wefts wound on bobbins. Her movements are fluid and graceful. There is more detail on my second visit with the Montagnard weavers in this post. Here is a short video I made of Ngach twining. After you watch the instructional video I have made, you will better understand what she is doing in the different movements. Watch how she twists the wefts sometimes once and sometimes twice and note how tightly she holds the warps under tension. She has her woven piece sewn around the metal bar so she can pull down on the warps. This is something I couldn’t do with my off-loom lap twining. I have tried both on and off-loom twining and find that I much prefer twining while my woven piece is still on the loom. For me, it is easier to twine around warps that are held under tension. This also allows me to twine in the middle of a weaving as the Bedouin often do. Something I have yet to try which I have seen in Bedouin textiles is twining a design that is completely embedded in the cloth, that is, it does not travel from edge to edge but sits in the middle completely surrounded by weaving. 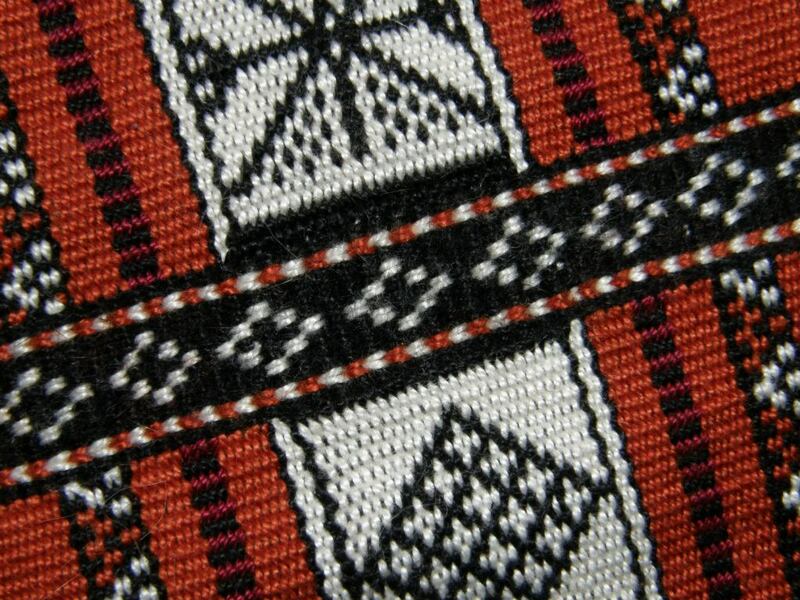 (see here…although I can’t be sure if this is twining or in fact wrapping, soumak or some other technique that is worked in conjunction with a ground weft which would bind the whole piece of fabric together). What do you all think? I have made two videos showing two-color twining as I do it on the loom (not as I was taught by Ngach.) The first video shows how to twine with two colors and determine which color shows on the surface to create your pattern. I am twining in the middle of a narrow band woven with yarn that is very similar to Plymouth Yarn Fantasy Naturale. I use the same yarn as the warp and weft for the twining and I twine around groups of six warps. I am working sitting in my backstrap loom with the warp under tension. 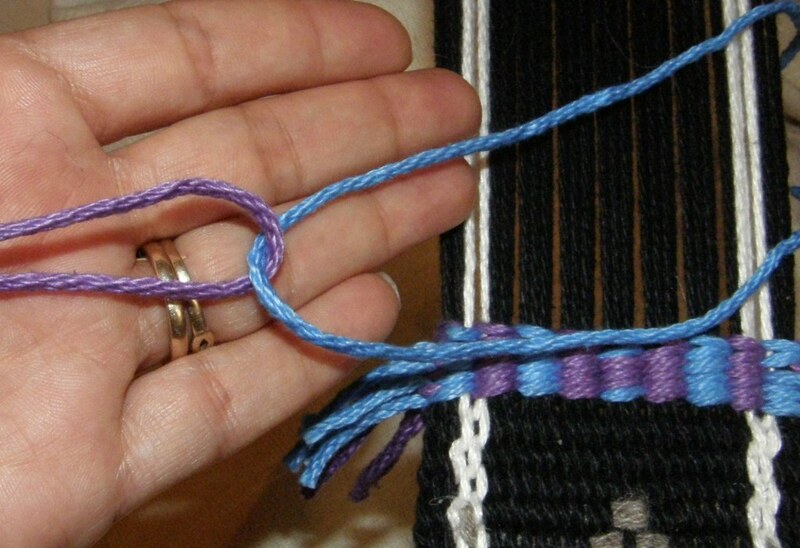 I start by tying the two strands of weft in a square knot. 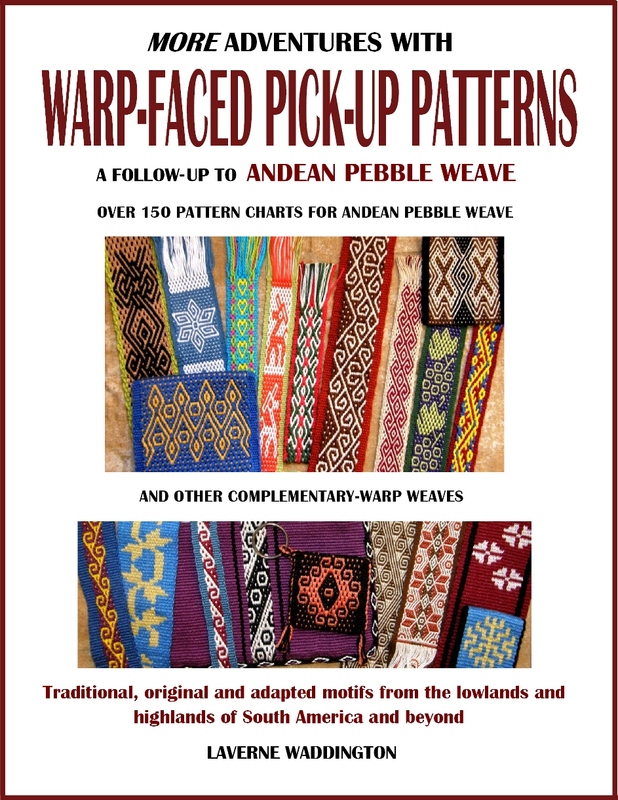 The Montagnard weavers twine from left to right leaving the weft tails hanging decoratively at both edges. If you are planning on sewing your piece and hiding the weft tails, you may want to start with a slip knot which you can later easily undo and therefore not have a bulky knot interfering with your seam. 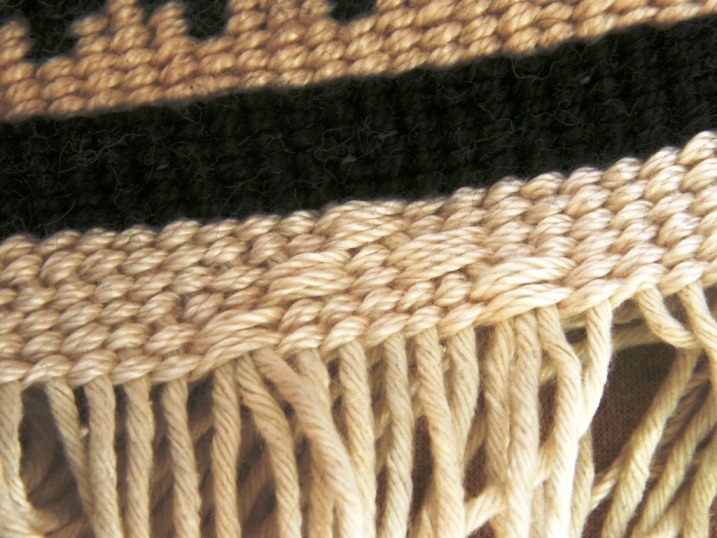 If you look closely, you will see that the twined wefts sit on the surface of the cloth at an angle. The next video shows how to create two rows of twining at once with the wefts lying at opposite angles creating little “v”s. To have this show up well, this kind of twining should be separated from the rest of the two-color twining by a row or two of single color preferably in a third contrast color. You can also stack several rows of this for a very nice effect. You can see it in red and white on this piece I made surrounded by black. I start by hooking the two threads together. By doing this, you won’t have starting tails. If you prefer to have tails, you can just knot the four strands together. As for the length of the wefts, I will leave that up to you to figure by trial and error. Unless you really want to avoid wasting yarn, I would go with long wefts which can be trimmed later. 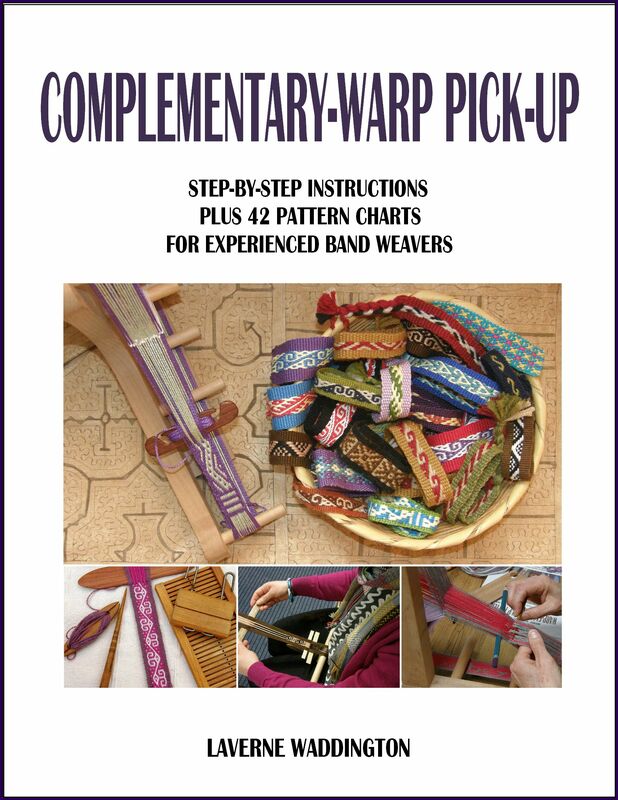 Having long pieces of weft to hold and work with in your hands is easier than having short ones which you can’t quite grasp. As you can see, the weft builds up around the warps in vertical columns. 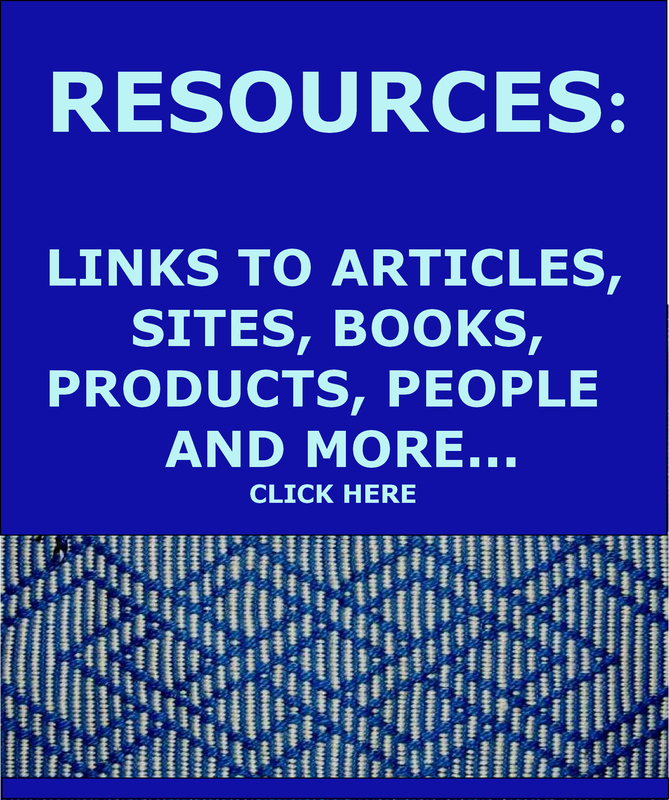 This means that any motif that has been drawn on a chart that is based on columns of squares can be used…motifs designed for cross stitch or knitting, for example. I choose to hide the little “bump” at the back of the fabric. I have seen Indonesian textiles that have the bump exposed and used as part of the design almost like little beads. In the videos I am twining up and away from the weaving line but I have also on occasion, done it the other way around. I finish my weaving and then return to the start and twine around the unwoven warp ends at the beginning of the piece. The twining grows towards me rather than away. Both ways work equally well for me. And what’s on the other side when you twine motifs? This is how the piece in the heavy yarn looks on both sides…. 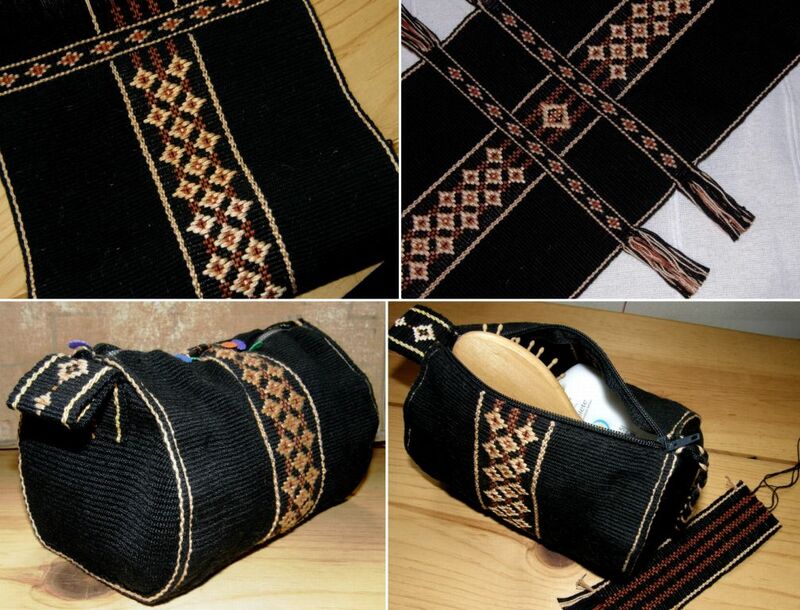 And here is the finer twining I did on the Montagnard-style piece that I wove…front and back. You will notice that the twined band is slightly wavy. As I had twined around groups of four warps, the twining actually turned out wider than the woven fabric. Since then, I have twined around groups of six warps and always used the same yarn as my warp and weft for the twining wefts. That works out perfectly. An entire piece can be made up of twining. Those off-loom pieces that I made with the chunky yarn, with a bit more practice, could be used for mug rugs or sewn into bags. You can twine around a piece of cardboard and form a tube to create a seamless bag as my friend Franco did. I twined around single strands of cotton string for those. The close-up at left will show you the material and a first attempt at some textured twining. For the piece in this picture I have used doubled strands of #3 crochet cotton for the weft. 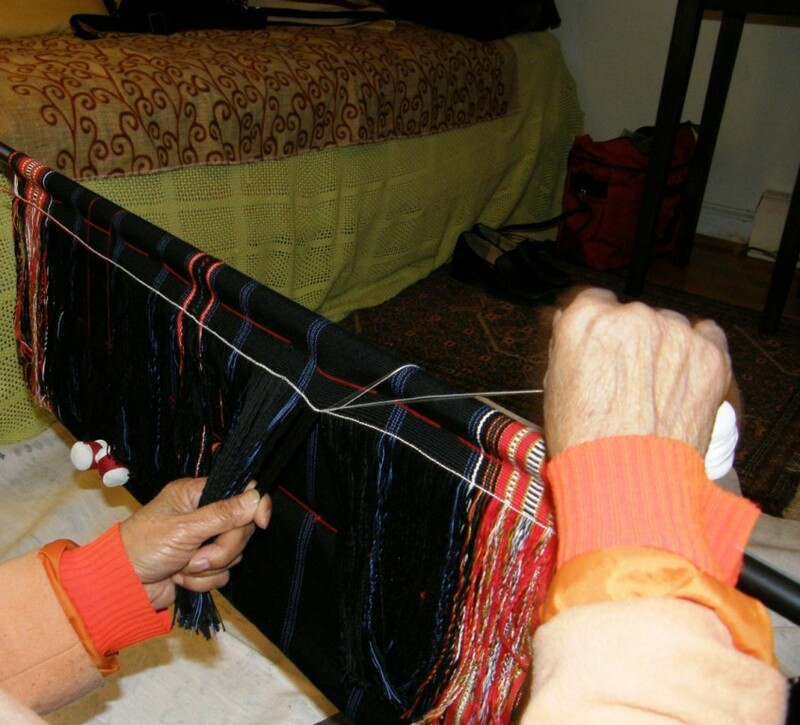 Twining on a woven piece adds a nice bit of decoration and can strengthen an edge. I have not seen exactly how the woven Bedouin tent dividers are hung but wonder if they are hung from the twining in the mid sections of the weaving. I imagine those tent dividers are very heavy and perhaps the stronger, more rigid twined parts can support the weight of the hung weaving (pure speculation on my part). I used twining in a single color to edge these placemats and mug rugs just for something different. I wanted a sturdy shoulder strap for my loom bag and so twined the whole thing with #10 cotton. 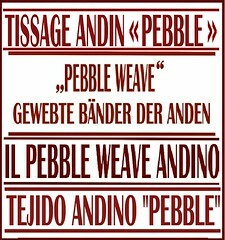 I twined in the word for ”weave” in different languages. The twining was done width-wise and all the weft ends were sandwiched between the twined band and another woven one which were sewn together. Remember the “sausage” bag I made last week? Well I finished it by sewing in the zip and am still lamenting the fact that the twining ended up on the bottom! It really holds a lot of stuff and will make a great toiletries bag for travel. 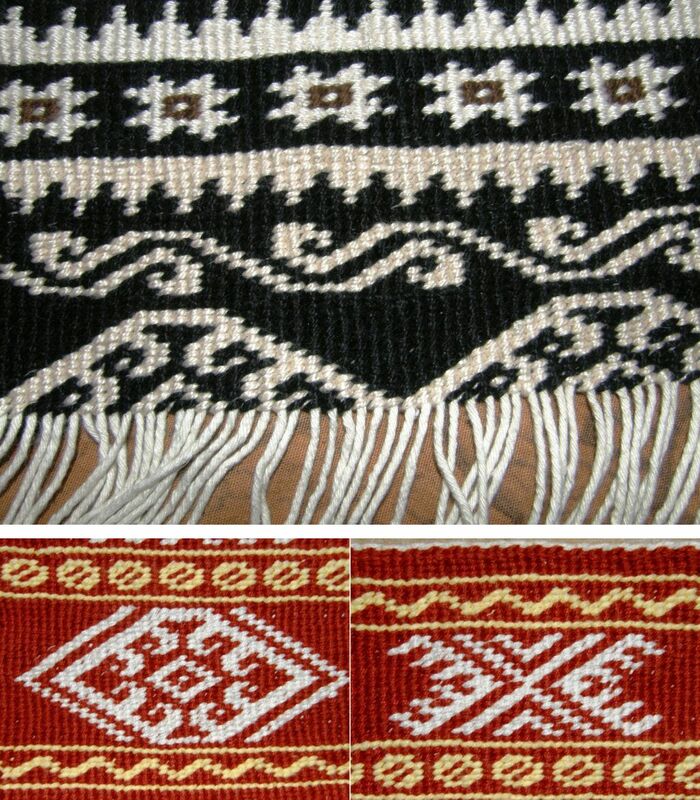 The twined motif has three colors in the center and with practice you will see that it is not any harder to twine with three colors than with two. Your designs are amazing. I am so inspired. Does twining at the end of a piece mean I don’t need to tie knots, or braid, or twist, for the ends? I keep looking for flat-laying ways to end my weaving, plus this is beautiful! If I twine several rows tightly and am not using slick thread, I don’t need to secure the warp ends in any other way. The twining is enough to hold everything in place. You will see my placemats that have twining around the warp ends. There at least 10 rows of twining on those. I have not experimented with fewer rows but some weavers in the Ravelry group used two rows of twining at the end of keyfobs and found that that was enough to secure the ends. You will need to experiment. Thanks so much! I can’t wait to try! Quick question about the way the Montagnard ladies do their twining: Do they twist their warp groups before twining? You mentioned the rice-stiffening, is this prep for twining or something else. I’m wondering if this was what I’m missing. They don’t twist the warp groups before twining. One of my teachers glued the warps together in groups with the rice paste in prep for twining and the other didn’t. Ps… Amanda… the video I have that shows Ju Nie applying rice paste and twisting the warps is not in preparation for twining. That is just her way of doing the typical fringe twisting that weavers do at the ends of their scarves and shawls. I really appreciate this post. Sincerely. Thank you for taking the time to share. Thank you! I hope you find something useful here.